Today we’d like to introduce you to Kelly Sullivan. Growing up, I worked in my grandparent’s cheese factories and store during the summer in Wisconsin. I learned at an early age what it took to be a business owner. You could say it’s in my blood. In addition to my grandparents, my father was a business owner as well as my uncle, two aunts and great grandmother. After graduating from Loyola Marymount University, I focused on working in business, particularly the service, telecommunications and marketing research/consulting industries where I honed my skills. My experience ranges between small start-ups to a Fortune 500. Acquiring my own business was a dream come true. 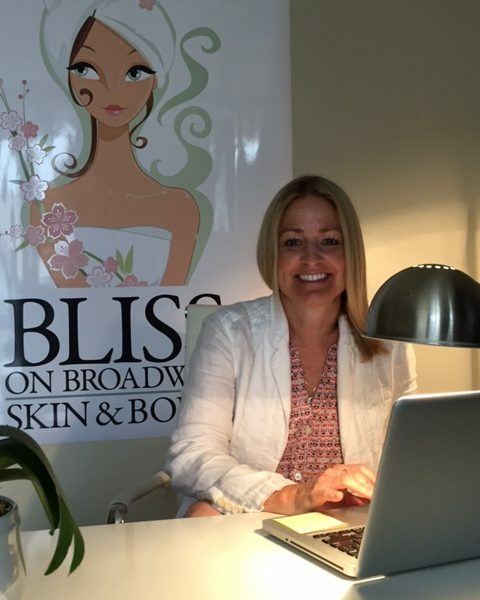 For the past 15 years I was also a client of Bliss on Broadway’s and partnered with the previous owner on developing and marketing a new service. This is when I became familiar with more than just the excellent service I had always received, I learned about the operations and functions of Bliss as well. I was hooked. Bliss’ core deliverable is relaxation and well-being. I’m a firm believer in caring for the mind, body and spirit and strive to make sure our clients leave happy and return. We have clients who’ve been coming to us for over 20 years. I’m pleased to know we continue to please. Understanding the nature of a small business takes time. I’m not particularly patient, but I’ve learned to accept patience is an asset in a small business. For the first three months after the initial purchase, I focused on learning day to day operations, getting to know staff and tracking sales patterns. During the next three months, I invested in aesthetic enhancements, adding staff and revising the brand and marketing materials. Doing this allowed me to understand where to market our services and meet client needs. Moving forward I will be focusing on best practices, where to build the business, focusing on the budget and a more complex system for measuring success. Managing client expectations and staff development have been the biggest challenges, but I’ve learned building relationships takes time and is a key to our success. Alright – so let’s talk business. Tell us about Bliss on Broadway Skin and Body – what should we know? Bliss on Broadway is a full-service spa offering everything from nail, facial and massage care to wedding packages and private parties. We also provide make-up and hair service. Bliss is a relaxing environment where we play soothing music, offer refreshments and focus on making sure our clients are fully relaxed. Our loyal clients would say we’re known for our longer massages during manicure and pedicures and personable and knowledgeable staff. I’m most proud of the people who work at Bliss. They care about our clients as if they are family. They invest their time in genuinely getting to know our clients and staying current on trends in the spa industry. Our manager, Jacqui, grew up working in her parents’ spa in Santa Monica and is always challenging herself to learn more. She wants to make sure our clients receive the most current treatments as the industry changes quickly. What sets us apart is our desire to take time to make our clients happy, one at a time. I’m blessed with a supportive husband, family and group of friends! I inherited an incredible manager who understands the business inside and out. She cares about it like it’s her own. I’m grateful for her support every day! I also brought in an expert in the field in marketing and design, Michelle Pryor. She’s also a close friend who understands my goals. Most notably the previous owner played a huge role in convincing me I could do it and holding my hand every step of the way. I still consider her a mentor and consult with her on a regular basis. She has been nothing but supportive and this attitude of support translated to her staff who greeted me with open arms. In fact, my first day began with a traditional “key ceremony” where we cut a ribbon, rang a bell and sprinkled the entry with salt, water and rice for good luck. It was a moment I will never forget- very spiritual and meaningful.